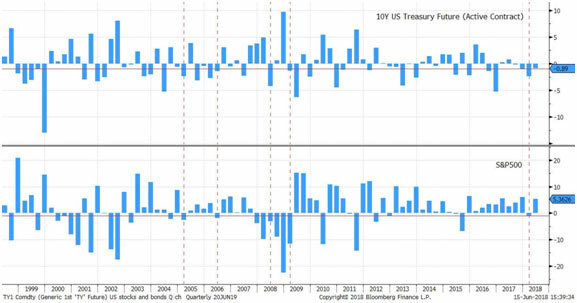 Since the beginning of the year, US 10-year Treasury yields have increased from 2.4% to 3.1%, driving the year- to-date return in these bonds– which have been considered a safe asset for over 30 years now- beyond -4%. Furthermore, during Q1 2018, for only the fifth time in 20 years and the first time in almost 10 years, US sovereign bonds fell in tandem with equities by more than 1%. More generally, the number of downturns in equities and bonds1 occurring simultaneously among developed markets has trended higher lately. Are we at the dawn of a change in paradigm in the relationship between equities and bonds, which could have major implications for multi-asset class portfolios – also known as “balanced” portfolios? Asset allocation, i.e. the proportion allocated to each asset class, is the very essence of the dilemma facing most investors. It also represents the core business of wealth managers. The objective of the allocation process is to achieve a level of diversification which enables a reduction in portfolio risk and optimises risk-adjusted returns. However, the benefits provided by diversification depend on the relationship between asset classes, gauged notably by the statistical concept of correlation, which determines the direction and strength of the relationship between two variables. The viability of the portfolio construction process therefore draws heavily on the correlation between equities and bonds, which are the two major components in balanced portfolios. Ideally, this correlation would be negative, enabling bonds to partially offset equity drawdowns and reduce portfolio volatility. Meanwhile, the negative contribution from bonds to portfolio returns during bullish equities/bearish bonds phases should remain marginal. Globally, there has been a negative correlation 2 between equities and bonds for more than 20 years in most developed economies 3. Multi-asset class investors have therefore been able to rely on the complementary performances staged by equities and bonds- the yin and the yang of the financial markets- enabling a reduction in both volatility and drawdowns. Moreover, the spectacular bull market observed among bonds over the past 30 years or so has enabled risk reduction for a negligible cost in terms of performance. Since 2000, the benefits of diversification between equities and bonds have been particularly notable during periods of financial crisis (2000-2002, 2007-2009), with bond allocations acting as a key stabilising factor in portfolios. The negative correlation which has prevailed over the past several decades gradually led portfolio managers to rely on the benefits of diversifying between equities and bonds, to the extent of ascribing to this strategy the status of absolute truth, based on the flight-to-quality narrative. According to this almost dogmatic rationale, bonds are always inversely correlated to equities and must therefore represent the main (and often the only) risk management measure. As the Nobel prize-winning behavioral economist Daniel Kahneman highlighted, people naturally need to understand the world in simplified narratives, which can sometimes interfere with rational decision-taking processes. As is the case with all types of dogma, this thought process is harmful, particularly since finance remains a human science. Financial reality is, of course, more complex. Acknowledging that correlations are dynamic and can change over time is essential to the portfolio construction process. The wealth of academic research devoted to this subject has revealed no less than four different stock-bond correlation regimes in the US during the past 90 years, all characterized by a specific macroeconomic context and spanning several decades. Since the global financial crisis, massive intervention by central banks via quantitative easing programmes has heavily impacted certain economic variables influencing the level of correlation between equities and bonds. One hypothesis formulated from recent studies claims that inflation and its volatility are determining factors in the equities- bonds relationship. On the one hand, rising inflation negatively impacts nominal bonds and, on the other hand, macroeconomic uncertainty triggered by inflation volatility weighs on equity valuation. In the current global context of tapering monetary stimulus measures within a mature economic cycle, we believe that a normalisation of certain economic factors is probable: gradual rise in inflation, heightened volatility of the latter and macroeconomic data, higher equity volatility regime and rising short-term rates. This situation would imply an increase in the correlation between equities and bonds and a decrease in the diversifying power of bonds. Given the current level of bond yields – which appear to have reached a secular low point in 2016 – and their upward trend, the capacity of bonds to offset an equity drawdown is diminishing and the asset class could even weigh on portfolio returns. To illustrate this point, a drop of 120 basis points would be required in current US 10- year yields (i.e. to below 2%) to fully offset a 10% downturn in equities in an equally-weighted portfolio. The situation is different in the Eurozone where there has been a positive correlation between equities and bonds for over 3 years now, and where bond yields have been unattractive for quite some time. Consequently, most investors are already heavily underweight in this asset class which, fortunately, has nonetheless gained over 3% during this period. With the possibility of seeing the diversifying virtues of bonds evaporate, the question of their exclusion from a balanced portfolio now has to be considered. This is particularly the case as other sources of diversification and alternative risk management mechanisms are now accessible to most investors. These alternative sources of diversification may also have some major advantages: attractive valuation, stable low or inverse correlation with equities, increasing diversifying powers when needed during bearish equity phases. Examples of these instruments include certain alternative strategies (relative value), some currency pairs (short AUD/JPY), long volatility strategies and relative value equity strategies (long defensive sectors/short market). The correlation between equities and bonds – the cornerstone of traditional balanced portfolio construction – is unstable throughout economic regimes, and investors would be wiser to no longer assume that bonds will continue to protect their equity exposure in the future. Although we are not predicting an imminent return of a positive4 correlation regime between equities and bonds, which would require an overhaul of strategic asset allocations, it would undoubtedly be more prudent to take the initiative and consider this correlation to be zero. In the end, sustaining a traditional equities/bonds mix as a primary source of diversification and risk reduction amounts to implicitly betting that the negative correlation regime in place over the past 20 years will endure. Changes in correlation regimes, a long-term phenomena in general, however have the potential to do more harm than a rise in volatility. Multi-asset class investors should consider alternative sources of diversification in order to maintain a truly “balanced” portfolio. We also believe it is essential to complement this broader diversification with active risk management. 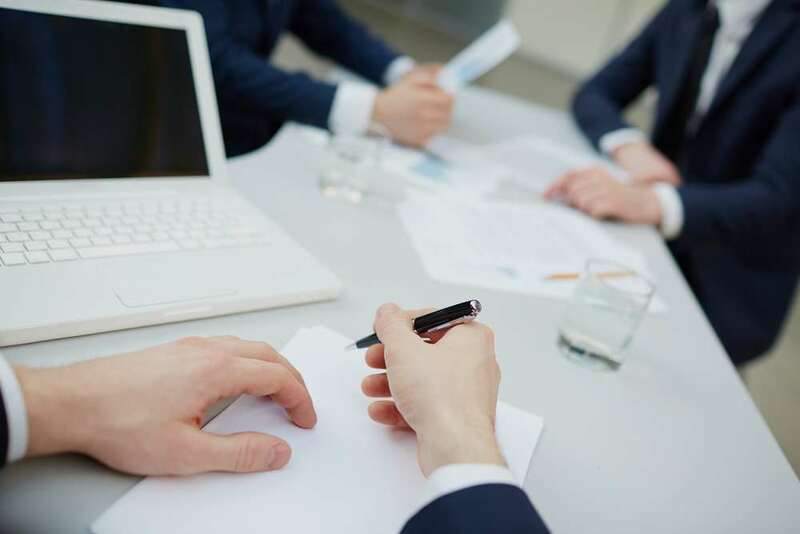 In this article the term “bonds” refers to sovereign 10-year bonds, which generally incur low default risk and serve as a benchmark for high-quality bonds. 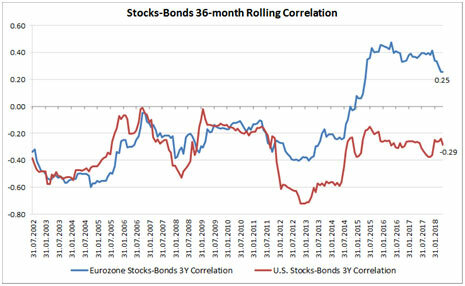 We measure the correlation between equities and bonds on a 5-year rolling basis with monthly data. The correlation in the Eurozone has been positive since 2015. According to one current theory, a significant increase in inflationary pressures and macroeconomic volatility could lead to a positive equities-bonds correlation regime.